Just Cooking N Baking ....: Neeru Dose / Crepe prepared with water and rice..
Neeru Dose / Crepe prepared with water and rice..
* Soak a Rice in vessel for whole night or 7 -8 hours. * Make the fine paste of soaked rice along with Jeera and Shredded coconut in a Mixer. * Add batter into a big Vessel and add the Water and salt. * Heat the Tawa and Make Neer Dosa. * Serve with Coconut Chutney , Gasi / Curry. 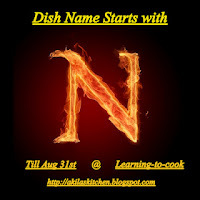 Sending this recipe to Dish Name Starts with N @ Akila's Kitchen.